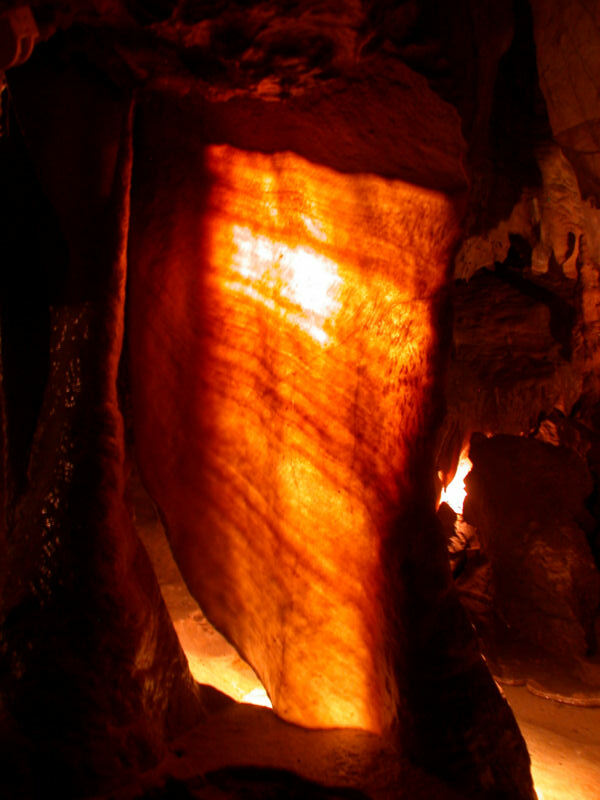 Image: curtain or bacon rind, the light from the back reveals the banding. Location: 80 km north northwest of Olomouc. On road 60 from Lipová-lázne to Vápenná and the Polish border. The road goes uphill along a huge marble quarry. Right behind the top of the hill. Parking along the road. Fee: Adults CZK 100, Children (6-15) CZK 50, Children (0-5) free, Students CZK 50, Disabled CZK 50, Seniors CZK 70. 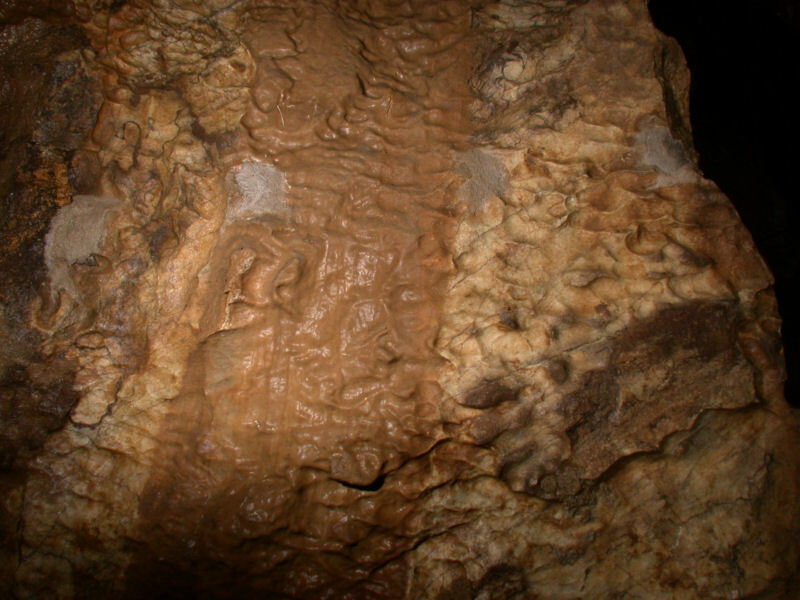 Classification: Karst cave. Devonian Marble, 400Ma. Dimension: L=1,000m, VR=70m, T=7°C, H=99%, A=543m asl. Guided tours: L=460m, D=45min., S=196, VR=12m, V=70,000/a . 1936 discovered by quarry workers, because of the war forgotten. 1945 exploration of the karst and caves stared. 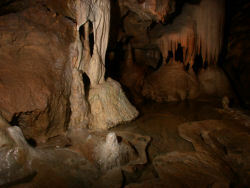 28-AUG-1949 cave rediscovered, development started. 16-MAY-1950 opened to the public. 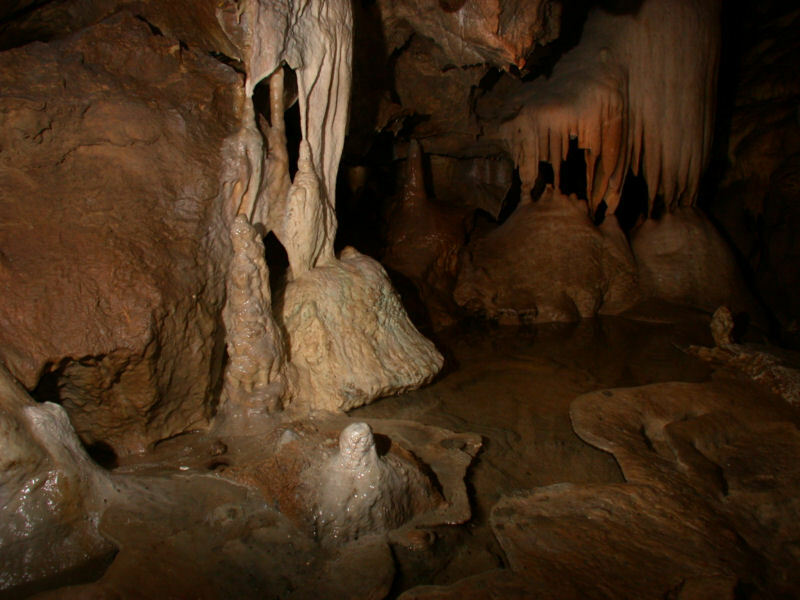 1955 show cave part expanded to the current state, reopened. 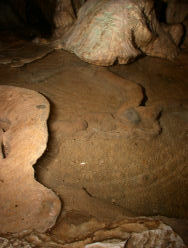 Image: rimstone pool with cave pearls. 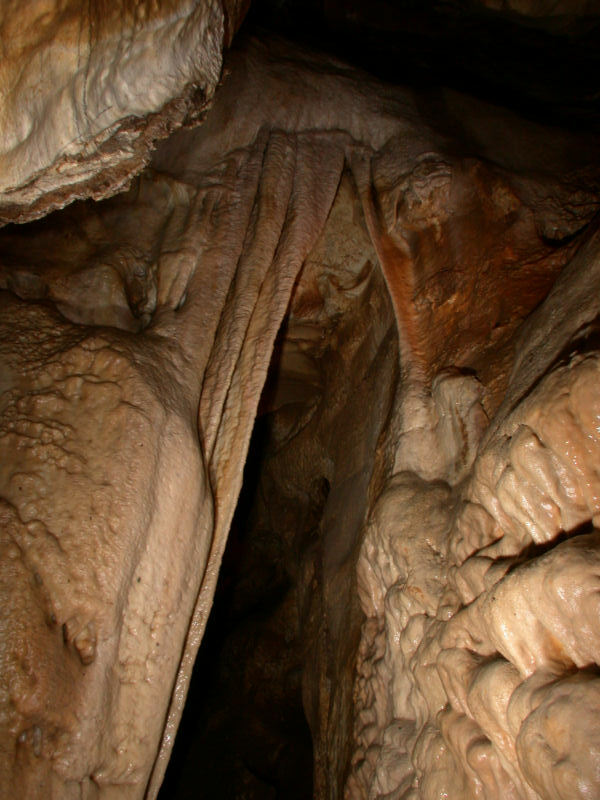 Jeskyně Na Pomezí (Na Pomezí Cave) is named after Na Pomezí pass (576m asl). It is the highest point between the little spa town Lipová Láznè and Vapenná on the road 60 from Lipová-lázne to Vápenná. North of the pass there is first the huge and modern entrance to the marble quarries, and then the cave entrance, right next to the road. The karst area drains to the north to a karst spring further down the road to Vápenná. 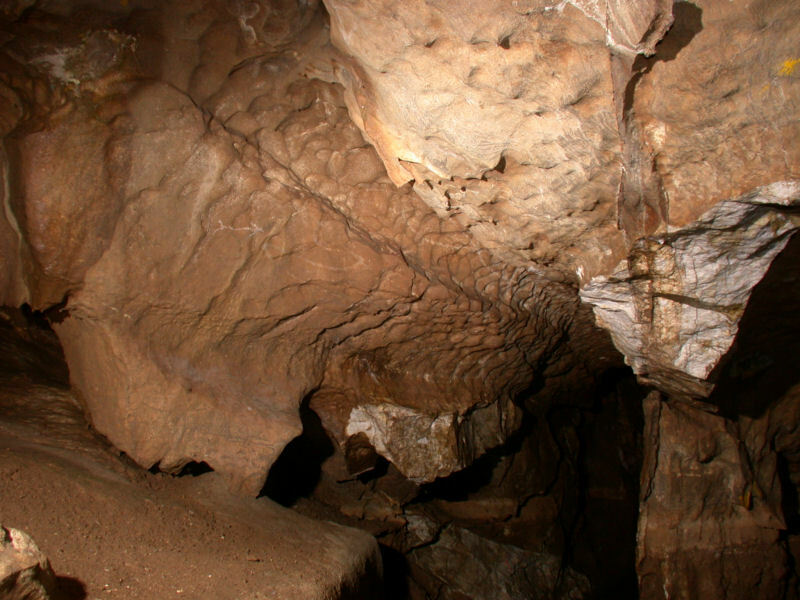 This is a rather small cave, at least compared to those in Moravian karst. 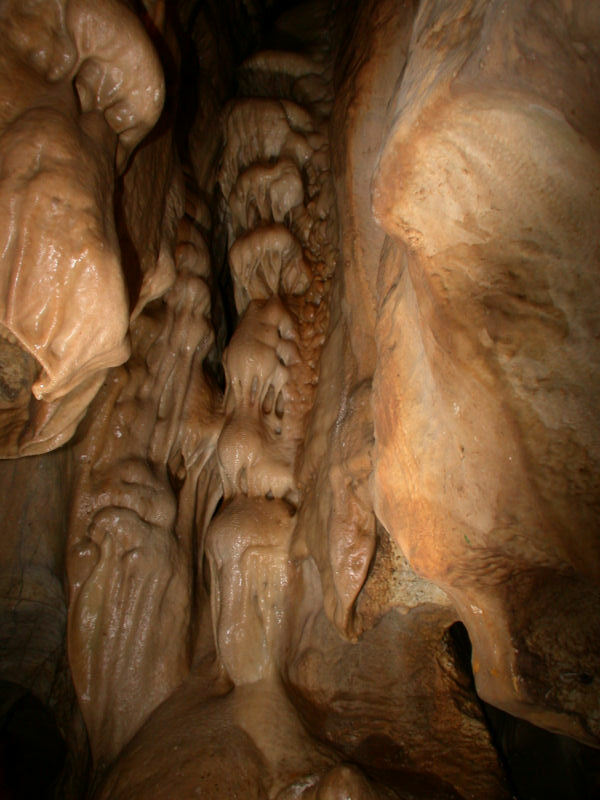 Nevertheless it is the biggest cave in marble in the Czech Republik. 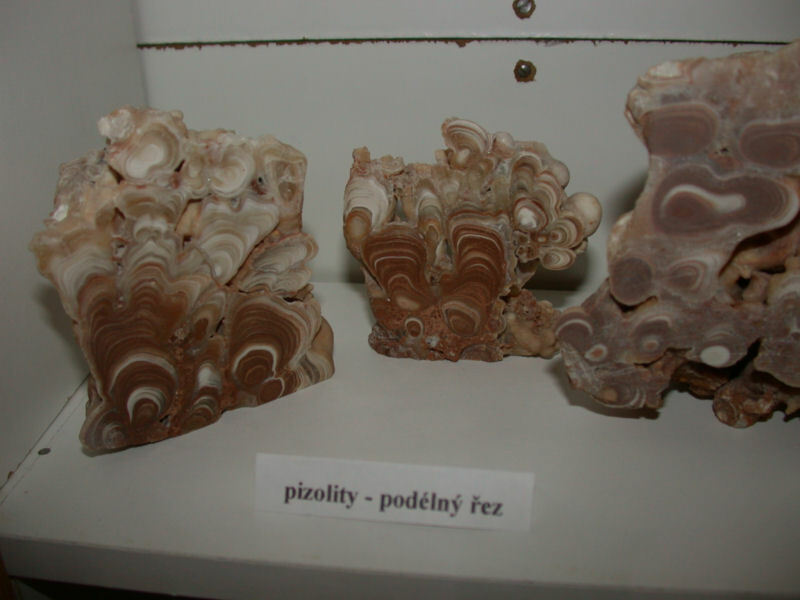 There are numerous small marble areas along the northern border to Poland, all of them karstified, but the caves are generally small. Na Pomezí has three levels, the lower two are developed, the passages are narrow and winding but high. 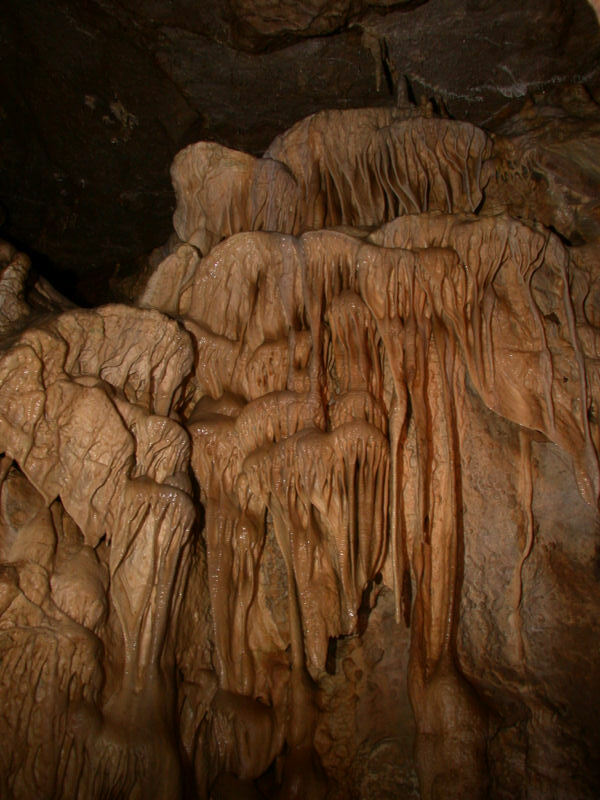 There are numerous fine speleothems including stalactites, stalagmites, pilars, bacon rinds and small rimstone pools. One rimstone pool is filled with sinter pearls. 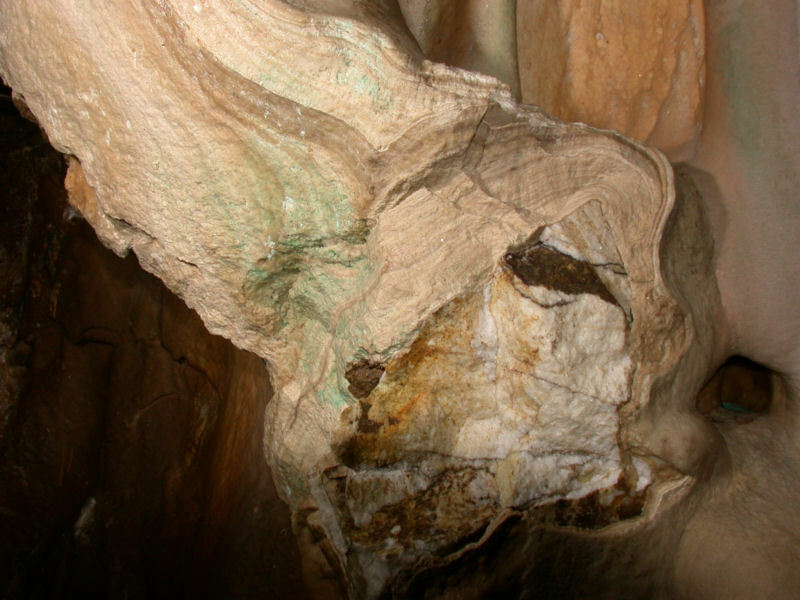 There is a formation called Petrified Dog, but it is actually a bough which is completely covered by flowstone. This formation is the symbol of the cave. The biggest chamber is the Kings Dome, which is 25m high, but only about 30m²m in size. 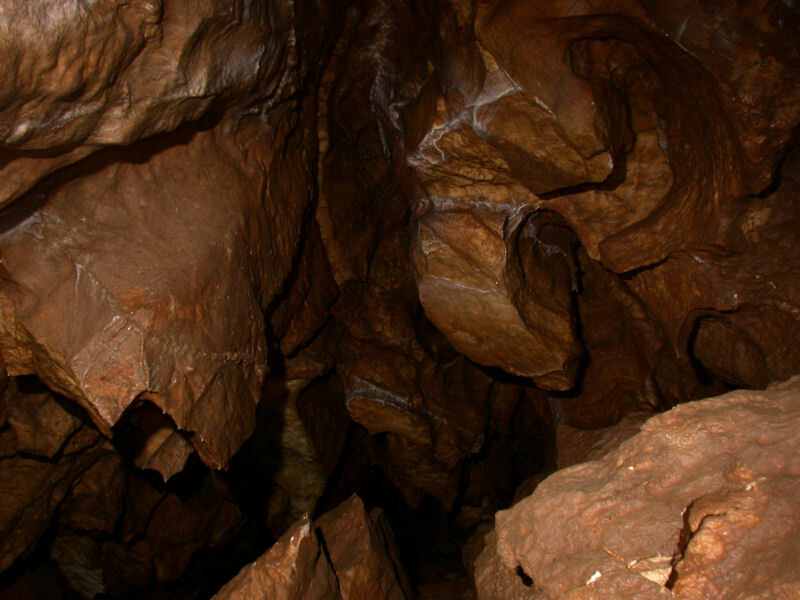 Na Pomezí cave was first discovered in 1936 by some quarry workers which removed marble in a now abandoned quarry east of the cave. 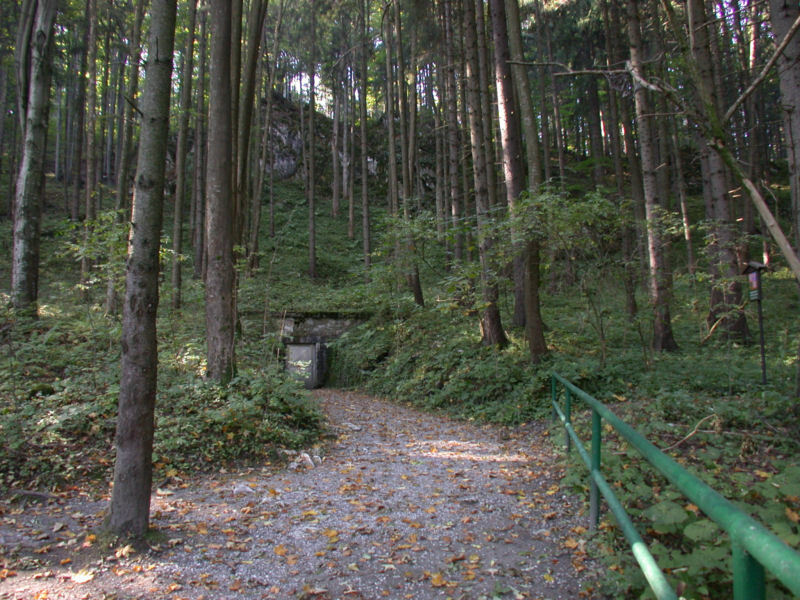 They discovered the cave, entered it, called it Kurt Höhle, and as typical for this time, left an inscription which said "Kurt Höhle 1936". But soon the cave was forgotten and during World War II nobody cared much about caves. This changed soon after the war, in 1946, when the tourist club Sokol Jesenik founded a speleologic section, which was headed by Karl Všetička. 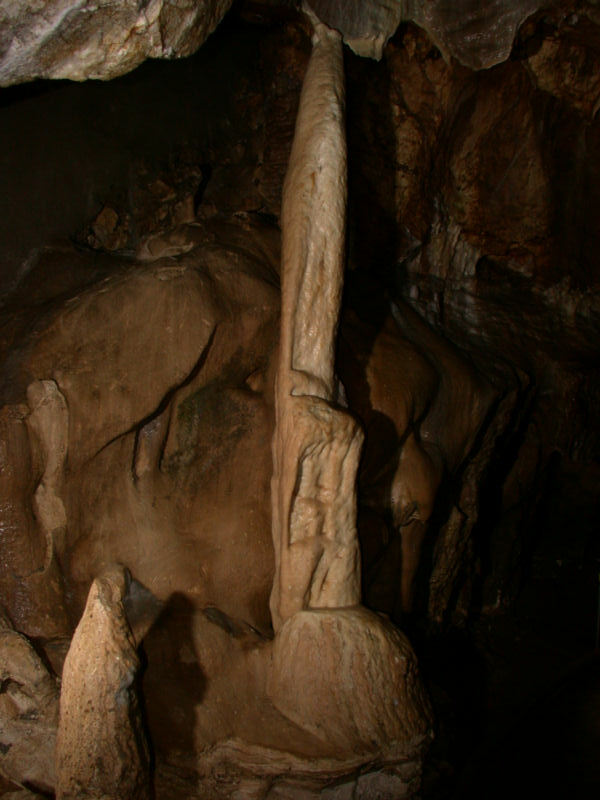 They discovered various caves in the area until finally on 28-AUG-1949 they opened a narrow shaft which brought them to the Na Pomezí Cave. First they thought they had discovered a new cave, but then the inscription was found. Nevertheles the cave was renamed, probably because the first name was in German, and after only half a year of development the cave was opened to the public. The entrance to this cave is in an abandoned quarry below the Na Pomezi saddle, 4km north of the health resort of Dolni Lipova Spa. 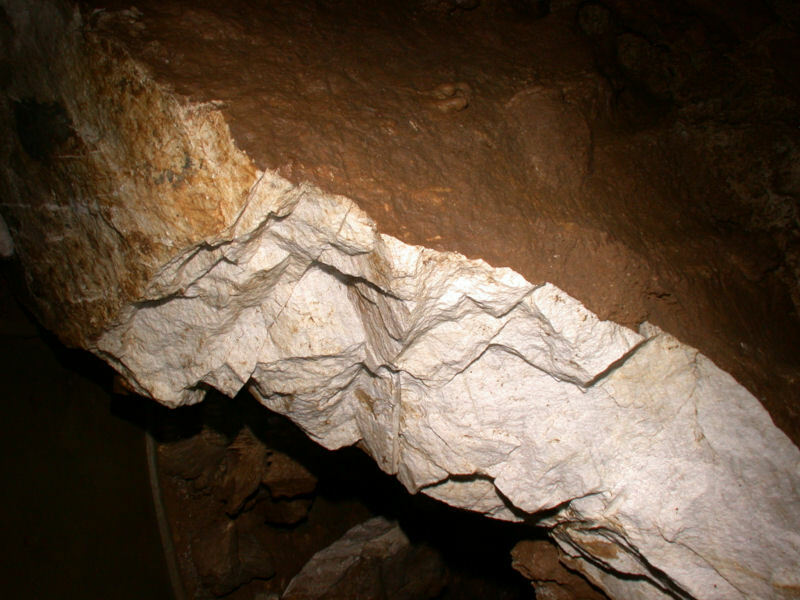 This is a large cave system formed by the solution of the metamorphised limestone [marble]. 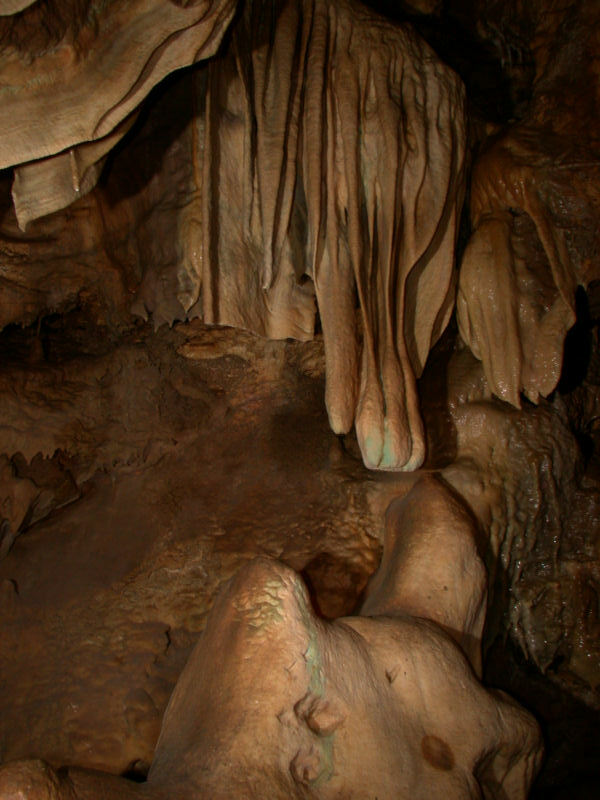 Discovered in 1936 and explored until 1949, it was opened to the public in 1950. It is decorated with fine snow-white spelothems. The most important parts of the cave system are the Ice Dome, the Weeping Willow Dome, the Roman Bath Corridor, and The Royal Chimney etc. Search Google for "Na Pomezi Cave"